Mitchell College, founded in 1938, is a private, coeducational college. Its 65-acre waterfront campus is located in New London. 68-acre campus in New London (population: 27,072). 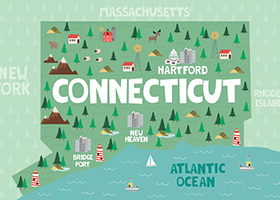 Served by bus and train; air serves Providence (50 miles) and Hartford (69 miles). School operates transportation to local transportation depot and shopping center. Public transportation serves campus.